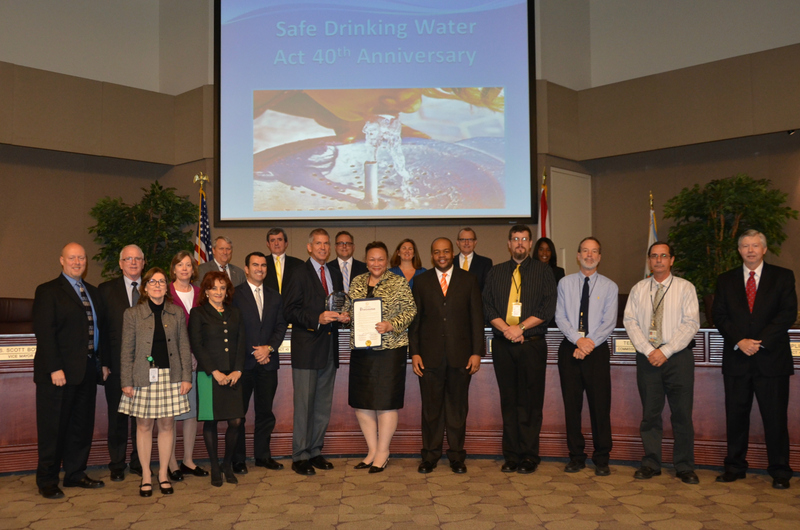 Orange County Utilities was awarded the 2014 Platinum Award for Utility Excellence by the Association of Metropolitan Water Agencies (AMWA). The utility, which was one of four recipients across the nation, was recognized for its efforts and achievement at Orange County’s Board of County Commissioners meeting held in early January. “AMWA awards recognize the serious commitment and significant progress these award-winning drinking water agencies are making toward long-term viability through innovative management practices, executive leadership and employee engagement,” said Chuck M. Murray, AMWA president and general manager of Fairfax Water. The annual award recognizes those utilities that successfully implement and reflect AMWA’s “Ten Attributes of Effective Utility Management and the Keys to Management Success.” To be eligible for the prestigious award, applicants must first win the association’s Gold Award, which the OCU Water Division received in 2005. “What an honor it is to be acknowledged by the water industry’s best as being one of the utilities that have exemplified what is every utility’s mission, which is to protect public health through the work that we do,” Jacqueline Torbert, manager of OCU’s Water Division said. Orange County Utilities provides water resources and solid waste services to protect and enrich the lives of the citizens and guests of Orange County.